The only interactive screen for projector in the world! Imagine: The ornamental painting of your most beautiful meeting room self-deployed as an interactive screen for projector in front of your VIP customers! Please find the only projection screens in the world that are both tensioned, foldable, design, customizable and interactive: Finally, you will project and share your finest corporate documents in High Definition in your meeting rooms or seminar rooms. Closed, your folding screen hides behind your favorite painting: product presentation, art reproduction, photo, or simple whiteboard for markers. 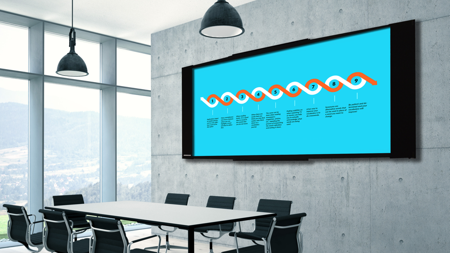 Thanks to our patented triptychal mechanism, your screen occupies just 3 times less space on the wall of your meeting room. The canvas curves back into the casing without ever wrinkling, even in the long term. No more costly ceilings and electrical cables. No more traditional warping of the old screens that rolled down from the ceiling. Opened, your projection screen unfolds like a triptych and self tensioned himself: thanks to its self-assisted opening, the operation is intuitive. 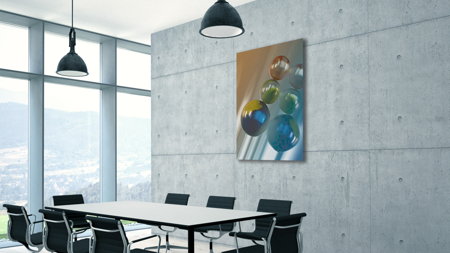 The quality of our canvases finally allows you to project your corporate documents in High Definition, on a large projection screen for VIP meeting rooms. If you projection screen was in addition a whiteboard for markers? Thanks to our patented concept, the front painting can be optionally replaced by a white board for markers: you will benefit from a new “2 in 1” solution. In the spirit of “FrenchTech innovation”, our screens allow you to combine two previously irreconcilable uses: quality canvas for High Definition projections, and white board for markers for work meetings. An interactive screen for projector unique in the world! Imagine: if your ornamental painting was deployed in a semi-rigid projection screen and became interactive? Thanks to our triptychal mechanism, three new panels placed at the back of the canvas can now provide a semi-rigidity on which it is possible to support: here are the only projection screens in the world that allow you to write on canvas. With the help of existing “eBeam” solutions, our screens allow you to combine high-definition projections of your company documents from PC or MAC, and have interactive projections with your projector! Write virtually on the canvas, move objects, open annotate and save your word/excel/ or powerpoint documents. More, you can even take a picture of your work and send it by email to the participants of your meetings! Provide the surprise of your guests, with the only projection screens in the world combining high definition projections and digital interactivity! You knew whiteboards, interactive projectors and interactive TV. More bigger are TV, more bigger are prices about 10,000€. At last please find the only interactive projection screens in the world, combining interactivity and canvas for high definition projectors on a very large screen. Now surprise and captivate your employees and VIP customers.